CLEVELAND (Sporting Alert) — LeBron James flirted with a triple-double, but his efforts were not enough to prevent Cleveland from losing for the first-time in these playoffs. The Chicago Bulls led from wire-to-wire to beat the Cavaliers 99-92 at Quicken Loans Arena, here in Cleveland on Monday to take Game 1 of the Eastern Conference semi-finals. Derrick Rose scored 25 points, five assists and five rebounds to lead the way for the Bulls, which shot 55.6 percents on 10-for-18 from three-point range. The visitors also went 50.0 percent from the floor on 40-for-80 shooting, as Pau Gasol chipped in with 21 points, 10 rebounds and four blocks and Jimmy Butler added 20 points, six assists, five rebounds and three steals. Chicago Bulls had never beaten James in the playoffs, but that impressive run has finally come to an end, which pleases Rose. Kyrie Irving led the Cavs with a game-high 30 points on 10-for-23 shooting to go along with his six assists. James finished with 19 points, 15 rebounds and nine assists for the Cavaliers on his way to surpassing former Chicago Bulls great Scottie Pippen for seventh-place on the all-time playoff list for assists, Dave McMenamin, @mcten, reports. He now has 1,054 assists and gets past Pippen (1,048). The star forward, though, thinks everyone must play better. He added: “For one, we’ll just focus on the next game. We’ll focus on (Tuesday) first. We’re going to watch the film and see ways we can get better — things that we’ve got to do to be better and try win that game, Game 2. Despite securing the road win and taking the advantage in the seven-game series, Bulls coach Tom Thibodeau also expects more from his team. “We know that we’re going to have to play a lot better than we did today,” he said. Mike Dunleavy, who started the game red-hot after knocking 4-for-4 from the field and going 3-for-3 from behind the arc, ended with 14 points and seven rebounds for the Bulls in the win. All-Star center Joakim Noah struggled in this game after he went 0-for-4 from the field and was held scoreless in 29 minutes of action. He did, however, contributed nine rebounds, four assists and two blocks for his team and felt that he did his job limiting the Cavaliers. “I think I guarded every guy they brought into the game,” he said. Iman Shumpert scored 22 points on 8-for-17 shooting for the Cavs, who was playing with Kevin Love and J.R. Smith in the home defeat. Love is out for the rest of the postseason after her underwent shoulder surgery, while Smith is suspended for the first two games of this series. The two players were missed, but Cleveland coach David Blatt wasn’t making any excuses, although hinting that he could make changes for the second game. He added: “Every game and every day teaches you something. Once you walk into the fire, you’ll come out either hurt badly or a lot smarter. Both teams made runs of their own with the Cavs evening up the game at 51-51 early in the third quarter, while pulling within four points, at 94-90, in the final minute before the Bulls, through Butler, grabbed the basket that sealed the game. 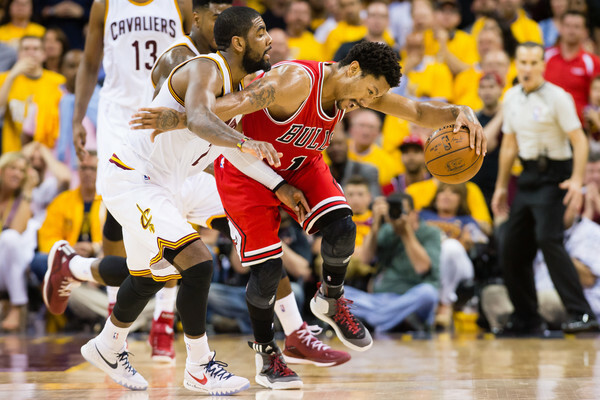 The Bulls outrebounded the Cavalier 51-45 and outassisted the hosts 23-17. Game 2 of this series is again here in Cleveland on Wednesday night. BOX SCORE REPORT AND STATS. Dunleavy 5-6 1-2 14, Gasol 10-16 1-1 21, Noah 0-4 0-2 0, Rose 11-26 0-0 25, Butler 7-16 4-6 20, Gibson 3-5 2-4 8, Hinrich 2-3 1-1 6, Brooks 2-4 0-0 5, Mirotic 0-0 0-0 0. Totals 40-80 9-16 99. James 9-22 1-2 19, Miller 1-2 0-0 3, Mozgov 3-8 3-4 9, Irving 10-23 9-9 30, Shumpert 8-17 2-2 22, Thompson 1-2 2-2 4, Marion 0-0 0-0 0, Dellavedova 2-5 0-0 5, Jones 0-2 0-0 0. Totals 34-81 17-19 92. 3-Pointer-Chicago 10-18 (Dunleavy 3-4, Rose 3-6, Butler 2-6, Hinrich 1-1, Brooks 1-1), Cleveland 7-26 (Shumpert 4-10, Miller 1-2, Dellavedova 1-4, Irving 1-5, Jones 0-2, James 0-3). Rebounds-Chicago 51 (Gasol 10), Cleveland 45 (James 15). Assists-Chicago 23 (Butler 6), Cleveland 17 (James 9). Total Team Fouls-Chicago 15, Cleveland 16. Turnovers-Chicago 10 (Noah 4), Cleveland 8 (James 6).